The Blaisdell YMCA is proud to be a partner for the last five Lyn Lake Street Festivals. The event has been designed to help the Y stay closely connected and grow as a more visible resource in the community. The YMCA thanks the Lyn Lake community for all its help and support its towards its annual fundraising. Blaisdell has one of the most diverse populations in its membership and has a very healthy population of many different cultures, Hispanic, East African, GLBT and many lower income families who wouldn’t be able to afford the many benefits to keep their families healthy without the support of scholarships. 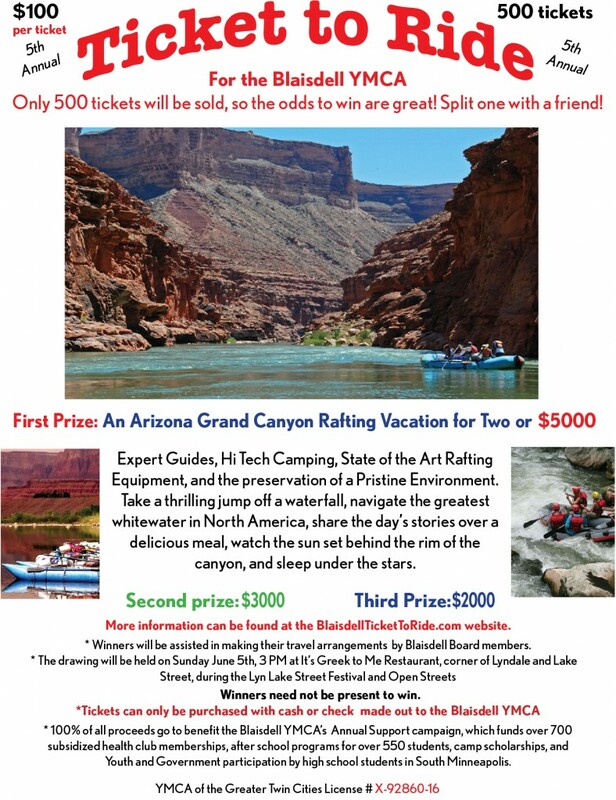 Our annual Ticket to Ride Raffle will hold it’s drawing for $10,000 in travel prizes at 3 PM at It’s Greek to Me during the Lyn Lake Street Festival on June 5th. Times are certainly changing and people’s lives and schedules are getting more complex, but in the midst of all that change, some needs remain constant. People need to engage in regular exercise to maintain good physical and mental health. Children need safe, caring places where they can be cared for and nurtured as they grow and learn new skills. Older youth need positive adult role models, healthy experiences and places to make good friends. Families need to play and have fun together; creating memories that become shared treasures. The newly remodeled Blaisdell YMCA addresses those needs and it does so while placing a special emphasis on the urban population that often faces the greatest challenges. Our vision is to create facilities that are safe, clean, open to all and respond to the needs of the community.